One of the UK's funniest comedy series finally makes it on to DVD. Who can forget classics like The Germans, The Kipper and the Corpse and The Anniversary? You know the episodes inside out, but the disc also provides a good selection of extras - the best being the interviews with Cleese, Scales and Sachs. 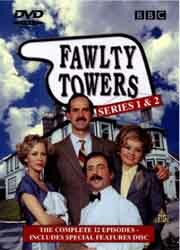 And look out for the Easter egg which shows what happened to the real Fawlty Towers. This is a must buy for anyone with a sense of humour - it matters not how many times we have seen these episodes they never fail to amuse. A cult series which has an impressive presentation on DVD. (All prices correct at time of going to press. Review Graveyard regrets it can take no responsibility for price changes made by participating stores).